Soft power is the ability to attract and co-opt, rather than coerce (hard power). Soft power is the ability to shape the preferences of others through appeal and attraction. A defining feature of soft power is that it is non-coercive; the currency of soft power is culture, political values, and foreign policies. Recently, the term has also been used in changing and influencing social and public opinion through relatively less transparent channels and lobbying through powerful political and non-political organizations. In 2012, Joseph Nye of Harvard University explained that with soft power, "the best propaganda is not propaganda", further explaining that during the Information Age, "credibility is the scarcest resource." Nye coined the term in a 1990 book, Bound to Lead: The Changing Nature of American Power. In this book, he wrote: “when one country gets other countries to want what it wants-might be called co-optive or soft power in contrast with the hard or command power of ordering others to do what it wants.” He further developed the concept in his 2004 book, Soft Power: The Means to Success in World Politics. The term is now widely used in international affairs by analysts and statesmen. For example, United States Secretary of Defense Robert Gates spoke of the need to enhance American soft power by "a dramatic increase in spending on the civilian instruments of national security – diplomacy, strategic communications, foreign assistance, civic action and economic reconstruction and development." In 2011, Xi Jinping was preparing to take power from General Secretary Hu Jintao, the 17th Central Committee of the Chinese Communist Party devoted a whole plenary session to the issue of culture, with the final Communiqué declaring that it was a national goal to "build our country into a socialist cultural superpower." And in 2014, Xi announced, "We should increase China's soft power, give a good Chinese narrative, and better communicate China's messages to the world." According to the Soft Power 30, an annual index published by Portland Communications and the USC Center on Public Diplomacy for 2018, the United Kingdom is the leading sovereign state in soft power. Other leading countries in soft power include France, Germany, the United States, Japan, Canada, Switzerland, Sweden, the Netherlands, Australia and Denmark. The 2016/17 Monocle Soft Power Survey ranks the United States as the leading country in soft power. The Elcano Global Presence Report scores the European Union highest for soft presence when considered as a whole, and ranks the United States first among sovereign states. Joseph Nye's 2004 book describing the concept of "soft power"
Joseph Nye introduced the concept of "soft power" in the late 1980s. For Nye, power is the ability to influence the behavior of others to get the outcomes you want. There are several ways one can achieve this: you can coerce them with threats; you can induce them with payments; or you can attract and co-opt them to want what you want. This soft power – getting others to want the outcomes you want – co-opts people rather than coerces them. It can be contrasted with 'hard power', which is the use of coercion and payment. Soft power can be wielded not just by states but also by all actors in international politics, such as NGOs or international institutions. It is also considered the "second face of power" that indirectly allows you to obtain the outcomes you want. A country's soft power, according to Nye, rests on three resources: "its culture (in places where it is attractive to others), its political values (when it lives up to them at home and abroad), and its foreign policies (when others see them as legitimate and having moral authority)." "A country may obtain the outcomes it wants in world politics because other countries – admiring its values, emulating its example, aspiring to its level of prosperity and openness – want to follow it. In this sense, it is also important to set the agenda and attract others in world politics, and not only to force them to change by threatening military force or economic sanctions. This soft power – getting others to want the outcomes that you want – co-opts people rather than coerces them." Soft power resources are the assets that produce attraction which often leads to acquiescence. Nye asserts that, "Seduction is always more effective than coercion, and many values like democracy, human rights, and individual opportunities are deeply seductive." Angelo Codevilla observed that an often overlooked essential aspect of soft power is that different parts of populations are attracted or repelled by different things, ideas, images, or prospects. Soft power is hampered when policies, culture, or values repel others instead of attracting them. In his book, Nye argues that soft power is a more difficult instrument for governments to wield than hard power for two reasons: many of its critical resources are outside the control of governments, and soft power tends to "work indirectly by shaping the environment for policy, and sometimes takes years to produce the desired outcomes." The book identifies three broad categories of soft power: "culture", "political values", and "policies." In The Future of Power (2011), Nye reiterates that soft power is a descriptive, rather than a normative, concept. Therefore, soft power can be wielded for nefarious purposes. "Hitler, Stalin, and Mao all possessed a great deal of soft power in the eyes of their acolytes, but that did not make it good. It is not necessarily better to twist minds than to twist arms." Nye also claims that soft power does not contradict the international relations theory of realism. "Soft power is not a form of idealism or liberalism. It is simply a form of power, one way of getting desired outcomes." Soft power has been criticized as being ineffective by authors such as Niall Ferguson in the preface to Colossus. Neorealist and other rationalist and neorationalist authors (with the exception of Stephen Walt) dismiss soft power out of hand as they assert that actors in international relations respond to only two types of incentives: economic incentives and force. As a concept, it can be difficult to distinguish between soft power from hard power. For example, Janice Bially Mattern argues that George W. Bush's use of the phrase "you are either with us or with the terrorists" was in fact an exercise of hard power. Though military and economic force was not used to pressure other states to join its coalition, a kind of force – representational force – was used. This kind of force threatens the identity of its partners, forcing them to comply or risk being labelled as evil. This being the case, soft power is therefore not so soft. However, rationalist authors[who?] would merely see this as an 'implied threat', and that direct economic or military sanctions would likely follow from being 'against us'. In cultural studies, the concept, soft power is often used for culture. However, Parc and Moon argue that soft power cannot replace culture; it is only a subset of "accumulable culture", which is an opposite concept of "accumulated culture". The first attempt to measure soft power through a composite index was created and published by the Institute for Government and the media company Monocle in 2010. The IfG-Monocle Soft Power Index combined a range of statistical metrics and subjective panel scores to measure the soft power resources of 26 countries. The metrics were organized according to a framework of five sub-indices including culture, diplomacy, education, business/innovation, and government. The index is said to measure the soft power resources of countries, and does not translate directly into ability influence. Monocle has published an annual Soft Power Survey since then. As of 2016/17, the list is calculated using around 50 factors that indicate the use of soft power, including the number of cultural missions (primarily language schools), Olympic medals, the quality of a country's architecture and business brands. The Soft Power 30, which includes a foreword by Joseph Nye, is a ranking of countries' soft power produced and published by the media company Portland in 2015. The ranking is based on "the quality of a country’s political institutions, the extent of their cultural appeal, the strength of their diplomatic network, the global reputation of their higher education system, the attractiveness of their economic model, and a country’s digital engagement with the world." The Elcano Global Presence Report scores the European Union first for soft presence when its member states are excluded and the EU is considered as a whole. Soft power, then, represents the third behavioral way of getting the outcomes you want. Soft power is contrasted with hard power, which has historically been the predominant realist measure of national power, through quantitative metrics such as population size, concrete military assets, or a nation's gross domestic product. But having such resources does not always produce the desired outcomes, as the United States discovered in the Vietnam War. The extent of attraction can be measured by public opinion polls, by elite interviews, and case studies. Nye argues that soft power is more than influence, since influence can also rest on the hard power of threats or payments. And soft power is more than just persuasion or the ability to move people by argument, though that is an important part of it. It is also the ability to attract, and attraction often leads to acquiescence. In international relations, soft power is generated only in part by what the government does through its policies and public diplomacy. The generation of soft power is also affected in positive (and negative) ways by a host of non-state actors within and outside the country. Those actors affect both the general public and governing elites in other countries, and create an enabling or disabling environment for government policies. In some cases, soft power enhances the probability of other elites adopting policies that allow one to achieve preferred outcomes. In other cases, where being seen as friendly to another country is seen as a local political kiss of death, the decline or absence of soft power will prevent a government from obtaining particular goals. But even in such instances, the interactions of civil societies and non-state actors may help to further general milieu goals such as democracy, liberty, and development. Soft power is not the possession of any one country or actor. The success of soft power heavily depends on the actor's reputation within the international community, as well as the flow of information between actors. Thus, soft power is often associated with the rise of globalization and neoliberal international relations theory. Popular culture and mass media are regularly identified as a source of soft power, as is the spread of a national language or a particular set of normative structures; a nation with a large amount of soft power and the good will that engenders it inspire others to acculturate, avoiding the need for expensive hard power expenditures. More particularly, international news was found crucial in shaping the image and reputation of foreign countries. The high prominence of the US in international news, for example, has been linked to its soft power. Positive news coverage was associated with positive international views, while negative news coverage with negative views. Because soft power has appeared as an alternative to raw power politics, it is often embraced by ethically-minded scholars and policymakers. But soft power is a descriptive rather than a normative concept. Like any form of power, it can be wielded for good or bad purposes. While soft power can be used with bad intentions and wreak horrible consequences, it differs in terms of means. It is on this dimension that one might construct a normative preference for greater use of soft power. One study finds that a state's soft power has a measurable effect on its exports. Countries that are admired for their positive global influence export more, holding other things constant. The Soviet Union competed with the U.S. for influence throughout the Cold War. The Soviets were engaged in a broad campaign to convince the world of the attractiveness of its Communist system. In 1945, the Soviet Union was very effective in attracting many in Europe from its resistance to Hitler, and in colonized areas around the world because of its opposition to European imperialism. The Soviets also employed a substantially large public diplomacy program that included: promoting their high culture, broadcasting, disseminating information about the West, and sponsoring nuclear protests, peace movements, and youth organizations. Despite all of this, the Soviets' closed system and lack of popular culture impeded the ability of the Soviet Union to compete with the U.S. in terms of soft power. A number of non-democratic governments have attempted to use migration as an instrument of soft power: Egypt under the rule of Gamal Abdel Nasser trained and dispatched thousands of teachers across the Arab world in an effort to spread ideas of anti-colonialism and anti-Zionism. In Cuba, the Fidel Castro regime's medical internationalism programme has dispatched thousands of medical professionals abroad for cultural diplomacy purposes. The Chinese-sponsored Confucius Institutes across the world rely on Chinese teachers in order to strengthen the country's soft power abroad. More recently, Turkey's migration diplomacy involves sponsoring the short-term emigration of imams across Europe and North America. After Pope John Paul II visited Poland in 1979, some political commentators said his visit influenced events against Poland's communist government, the Soviet Union, and ultimately communism, which promoted atheism. Besides the Pope's visit, American-government broadcasting and propaganda into Soviet-occupied Europe, particularly Poland, contributed to the rise of the Solidarity movement and to the collapse of the Soviet-backed governments there and in the rest of the Warsaw Pact alliance. The United States and Europe have consistently been sources of influence and soft power. European culture's art, literature, music, design, fashion, and even food have been global magnets for some time. Europe and the U.S. have often claimed to support human rights and international law throughout the world. Unlike the U.S., Europeans' love of football enhances their soft power globally, whereas the primary sports of the U.S. such as American football and baseball are largely unpopular on the world stage. In 2012, the European Union was awarded the Nobel Peace Prize "for over six decades [it has] contributed to the advancement of peace and reconciliation, democracy and human rights in Europe." The U.S. has the largest diplomatic network in the world, the largest number of foreign journalists based in the country, and is the most popular destination for international students. American films, among other influences, have contributed to the Americanization of other cultures. Asia and more recently China have been working to use the potential soft power assets that are present in the admiration of their ancient cultures, arts, fashion and cuisine. China is presenting itself as a defender of national sovereignty, which became an issue after the NATO air campaign to oust Colonel Muammar Gaddafi and NATO's support of the rebels in Libya. The Chinese are also competing with the United States to gain influence throughout the South Pacific, however some commentators have said their recent assertiveness in this region has created an appeal for nations in this region to align with the United States thus increasing U.S. soft power in this area. Soft power extends beyond the operations of government, to the activities of the private sector and to society and culture at large. Soft power has gained more influence because it addresses the underlying dispositions of the people who have increasingly become more active in their governments. This is true even in authoritarian countries where people and institutions are increasingly able to shape the debate. The information age has also led to the rise of soft power resources for non-state actors, Primarily, through the use of global media, and to a greater extent the internet using tools such as the World Wide Web, non-state actors have been able to increase their soft power and put pressure on governments that can ultimately affect policy outcomes. Instead of front organizations, non-state actors can create cyber advocacy organizations  to recruit members and project their voice on the global stage. China's traditional culture has been a source of attraction, building on which it has created several hundred Confucius Institutes around the world to teach its language and culture. The enrollment of foreign students in China has increased from 36,000 a decade before to at least 240,000 in 2010. China's Asian Infrastructure Investment Bank has attracted many western countries to join. In 2017, China had the second largest diplomatic network in the world. A spring 2014 Global Attitudes survey from Pew Research Center states China receives mostly positive reviews in the sub-Saharan African nations polled, although South Africans are closely divided (45% favorable, 40% unfavorable). China's increasing soft power can be explained by looking at China's economic growth and regarding economic engagement with many African countries. China's expansion of trade and investment on the African continent and the spread of Chinese-led infrastructure projects gives positive impressions of China to people in Africa. China's economic engagement in African countries is considered as much more pragmatic and in consistency with the priorities of many African countries. Moreover, China's increasing role as a global superpower seems appealing and this drives a desire to tie African economies more closely to China's economy. Through the use of GONGOs (otherwise known as a Government-organized non-governmental organization), China exerts soft power through foreign aid and development in Africa. China has made a systematic effort to expand and give greater profile to its soft-power policies in Africa ever since the first Forum on China-Africa Cooperation in 2000. The commitments of China's soft power ranges from health, humanitarian assistance to academic, professional and cultural exchange. China's assistance to Africa, however, is not near the U.S. assistance in Africa. Cultural exchange between China and Africa can be a representative example of how China has been spreading its soft power. In 2005, the first Confucius Institute was established in Africa. The institute is funded by the Chinese government and it provides Chinese language and cultural programming to the public. There are 19 institutes today in Africa and China has planned to spend 20 million renminbi for education projects in South Africa, including the teaching of Mandarin in 50 local high schools. Furthermore, there is an increasing support for cultural visitors programs which gained momentum in 2004 when the African Cultural Visitors Program was established. There is a rising number of African entrepreneurs who choose to move to China and there are also diaspora communities in many Chinese cities that have been found. Outside of Africa, Chinese soft power extends to countries like Barbados. Barbadian Prime Minister David Thompson expressed admiration for the Chinese economic model and sought to emulate the way Chinese state controlled banks guided development. France has long exerted a great amount of soft power. The country and its culture have for centuries been admired in many parts of the world; so much so that Thomas Jefferson is famously quoted as saying "Every man has two countries, his own and France." The very term "culture" comes from France. In 2017, France had the third largest diplomatic network in the world. France was a focal point of the Age of Enlightenment; its attachment to the ideals of liberty, equality, tolerance and reason was notably embodied in the writing and publishing of the Encyclopédie. The French Revolution was one of the most significant events in European and world history. France has since then been instrumental in spreading Republican ideals. The Napoleonic Code, which influenced much of the rest of Europe and beyond, is regarded as one of the most important law document of the modern era. The French language has for centuries been an important diplomatic language. For example, French has to be used – on par with English – for all documents issued by the United Nations Treaty Series, ensuring that all UN treaties are equally valid in their English and French versions. France has also followed for decades a very active diplomatic and cultural policy. The Alliance Française, whose aim is to promote the French language and French culture, was created as early as 1883. In Monocle's 2015 "Soft Power 30" report, France was ranked first in the "engagement" criteria, which is intended to measure "the reach of states’ diplomatic network and their commitment to major challenges like development and the environment." Monocle further noted that "In terms of influential reach, France is the best networked state in the world and is member of more multi-lateral organisations than any other country." Overall, France ranked fourth in that study. France's laïcité, secularism, policy has inspired some countries over time. For instance, France was Atatürk's main role model for Westernization as part of the major reform efforts that he spearheaded when he was President of Turkey. France, and in particular Paris, has long been considered one of the most romantic places to be. France was in 2014 the most visited country in the world. The annual soft power rankings by Monocle magazine and the Institute for Government ranks 30 countries which “best attract favor from other nations through culture, sport, cuisine, design, diplomacy and beyond.” Monocle magazine said: “Merkel may be painted as a stern taskmaster but it seems she has a softer side, or the country she leads does.” It said Germany's rise as a soft power should not come as a surprise. “The country is traditionally excellent at pursuing its ideas, values and aims using diplomatic, cultural and economic tools," it said. “By quietly doing the simple things well it is a country that has become a global power and the rest of us can feel comfortable with that.” Germans had been understandably wary about depicting a dominant image abroad, the magazine added, but it said that the country's rise should not make everyone else feel uncomfortable. In 2017, Germany had the eighth largest diplomatic network in the world. The famous elements of Italian soft culture are its art, music, fashion, and iconic food. Italy was the birthplace of opera, and for generations the language of opera was Italian, irrespective of the nationality of the composer. Popular tastes in drama in Italy have long favored comedy; the improvisational style known as the Commedia dell'arte began in Italy in the mid-16th century and is still performed today. Before being exported to France, the famous Ballet dance genre also originated in Italy. The country boasts several world-famous cities. Rome was the ancient capital of the Roman Empire and seat of the Pope of the Catholic Church. Florence was the heart of the Renaissance, a period of great achievements in the arts that ended the Dark Ages. Other important cities include Turin, which used to be the capital of Italy, and is now one of the world's great centers of automobile engineering. Milan is a fashion capital of the World. Venice, with its intricate canal system, attracts tourists from all over the world especially during the Venetian Carnival and the Biennale. Italy is home to the greatest number of UNESCO World Heritage Sites (51) to date, and according to one estimate the country is home to half the world's great art treasures. The nation has, overall, an estimated 100,000 monuments of any sort (churches, cathedrals, archaeological sites, houses and statues). Italy is considered the birthplace of Western civilization and a cultural superpower. In 2017, Italy had the eleventh largest diplomatic network in the world. "Cool Japan" is a concept coined in 2002 as an expression of Japan's popular culture. The concept has been adopted by the Japanese government as well as trade bodies seeking to exploit the commercial capital of the country's culture industry. It has been described as a form of soft power, "the ability to indirectly influence behavior or interests through cultural or ideological means." In a 2002 article in the journal Foreign Policy titled “Japan’s Gross National Cool”, Douglas McGray wrote of Japan “reinventing superpower” as its cultural influence expanded internationally despite the economic and political problems of the “lost decade.” Surveying youth culture and the role of J-pop, manga, anime, fashion, film, consumer electronics, architecture, and cuisine, McGray highlighted Japan's considerable soft power, posing the question of what message the country might project. He also argued that Japan's recession may even have boosted its national cool, due to the partial discrediting of erstwhile rigid social hierarchies and big-business career paths. In 2017, Japan had the fifth largest diplomatic network in the world. Russia has been developing its soft power by investing in various public diplomacy instruments throughout the 2000s but the term was first used in an official document in 2010 as President Medvedev approved an Addendum to the national Foreign Policy Concept. The term was not defined but it was described as related to cultural diplomacy. In 2013, the term appeared in a new version of the Foreign Policy Concept where the soft power was defined as "a comprehensive toolkit for achieving foreign policy objectives building on civil society potential, information, cultural and other methods and technologies alternative to traditional diplomacy." In 2007, Russian President Vladimir Putin was named Time Person of the Year. In 2013, he was named most powerful person by Forbes magazine. In 2015, Russia led the creation of the Eurasian Economic Union. In 2017, Russia had the fourth largest diplomatic network in the world. In the wake of the poisoning of Sergei and Yulia Skripal in 2018, the BBC reported that "Its extensive diplomatic network reflects both its imperial history as a great power in the 19th Century, as well as its Cold War posture. It has a multitude of posts in Eastern Europe and former communist allies including China, Vietnam, Cuba and Angola, as well as legacies of the former USSR in Africa and Asia. The size of its network reflects the extent of its undiminished global ambition." U.S. President Barack Obama: "...And of course, around the world, people are being swept up by Korean culture -- the Korean Wave"
is making its mark on the world. "Hallyu", also known as the "Korean Wave", is a neologism referring to the spread of South Korean culture since the late 1990s. According to a Washington Post reporter, the spread of South Korean entertainment has led to higher sales of other goods and services such as food, clothing, and Korean language classes. Besides increasing the amount of exports, the Korean Wave is used by the government as a soft power tool to engage with the masses of young people all over the world, and to try reduce anti-Korean sentiment. In the 21st century, culture is power. —  Former South Korean president Park Geun-hye. In 2012, the BBC's country rating poll revealed that public opinion of South Korea has been improving every year since the first rating poll for the country was conducted in 2009. In several countries such as Russia, India, China and France, public opinion of South Korea turned from slightly negative to generally positive. The report cited culture and tradition as among the most important factors contributing to positive perceptions of South Korea. This comes alongside a rapid growth in the total value of cultural exports which rose to US$4.2 billion in 2011. First driven by the spread of Korean dramas televised across East, South and Southeast Asia during its initial stages, the Korean Wave evolved from a regional development into a global phenomenon due to the proliferation of Korean pop (K-pop) music videos on YouTube. Currently, the spread of the Korean Wave to other regions of the world is most visibly seen among teenagers and young adults in Latin America, the Middle East, North Africa, and immigrant enclaves of the Western world. Since the period of Pax Britannica the United Kingdom has held significant soft power. Today it remains one of the most influential countries in the world, coming first in the 2018 and 2015 Portland Group, Comres, Facebook report, and the Monocle survey of global soft power in 2012. The UK has strong diplomatic relations with countries around the world, particularly countries in the Commonwealth of Nations and many others in Europe, Asia, the Middle-east, Africa and the United States. Diplomatic missions between Commonwealth countries are known as High Commissions rather than Embassies to indicate the closeness of the relationship. The UK exerts influence on countries within the European Union, and has the seventh largest global network of diplomatic missions as of 2017. Many countries around the world use the British form of democracy and government known as the Westminster system. The influence of British culture and sports are widespread, particularly notable during the British Invasion, Cool Britannia, and more recently the Diamond Jubilee and 2012 Summer Olympics. The opening and closing ceremonies celebrated British culture and achievements with the world. London was the first city to host the modern Olympics three times. British media is broadcast internationally, notably the BBC World Service, BBC World News and The Economist magazine. British film and literature have international appeal, and British theatre helps make London one of the most visited cities in the world. Schools and universities in Britain are popular destinations for students of other nations. Alongside the English language, English contract law is the most important and most used contract law in international business. London is the headquarters for four of the world's six largest law firms. The UK and more specifically London is a centre of international finance where foreign participants in financial markets come to deal with one another. It is headquarters for major international corporations, many of which choose to be listed on the London Stock Exchange. Following the poisoning of Sergei and Yulia Skripal in 2018, the UK responded with bilateral and multilateral diplomatic efforts that led to nations around the world expelling one hundred and fifty Russian diplomats, described by CNN as a "remarkable diplomatic coup for Britain". British prime minister Theresa May stated in parliament that the coordinated global response was the "largest collective expulsion of Russian intelligence officers in history." Subsequently, Russia attempted to attribute some of the influence to the United States, this was seen to be a propaganda exercise designed to damage the UK's international prestige and found to be untrue following statements by the various states as well as the entirety of the European Union. The United States has long had a great deal of soft power. Examples include Franklin D. Roosevelt's four freedoms in Europe at the end of World War II, young people behind the Iron Curtain listening to the government's foreign propaganda arm Radio Free Europe, Chinese students symbolizing their protests in Tiananmen Square by creating a replica of the Statue of Liberty that they called "Goddess of Democracy", newly liberated Afghans in 2001 asking for a copy of the Bill of Rights and young Iranians today surreptitiously watching banned American videos and satellite television broadcasts in the privacy of their homes. America's early commitment to religious toleration, for example, was a powerful element of its overall appeal to potential immigrants; and American aid in the reconstruction of Europe after World War II was a propaganda victory to show off the prosperity and the generosity of the people of the United States. Studies of American broadcasting into the Soviet bloc, and testimonials from Czech President Václav Havel, Polish President Lech Wałęsa, and Russian President Boris Yeltsin support that soft power efforts of the United States and its allies during the Cold War were ultimately successful in creating the favorable conditions that led to the collapse of the Soviet Union. "Satellite TV is actively promoting American soft power in the Arab world in ways that the United States has been incapable of doing. The launch of the Arabic-language Alhurra satellite channel in early 2004 to provide news and entertainment in ways more beneficial to the U.S., marked an important turning point in U.S. public diplomacy development. Though it calls itself the largest Arabic-language news organization in the world, the Virginia-based Alhurra lacks the cachet and brand recognition of Al Jazeera, but its balanced presentation of news has earned it a small but significant viewership. Controversial innovations in radio broadcasting that target young mass audiences through a mix of light news and mild American popular music – Radio Sawa in Arabic and Radio Farda in Persian – have captured a substantial market share in their target regions." ^ Nye, Joseph (8 May 2012). "China's Soft Power Deficit To catch up, its politics must unleash the many talents of its civil society". The Wall Street Journal. Retrieved 6 December 2014. ^ a b Nye, Joseph.Bound to Lead: The Changing Nature of American Power(London: Basic Books, 1990). ^ McClory, Jonathan (12 July 2018). "The Soft Power 30: A Global Ranking of Soft Power, 2018" (PDF). Portland. Retrieved 18 April 2019. ^ a b c "Elcano Global Presence Report 2018" (PDF). Real Instituto Elcano. 2018. p. 20. Retrieved December 5, 2018. ^ "From Seville to Brussels: The Architecture of Global Presence". International Relations and Security Network. October 28, 2015. Retrieved December 9, 2015. Our partners at the Elcano Royal Institute have released their latest edition of the Global Presence Index. It confirms that the EU – if perceived as a single global actor – has the greatest degree of ‘presence’ in the world, largely because of the contributions of the UK, Germany and France. ^ Joseph s. Nye, Jr (2004-03-16). Soft Power: The Means to Success in World Politics. ISBN 978-1586482251. ^ Nye, Joseph S. (2011). The Future of Power. New York: PublicAffairs. p. 84. ISBN 9781586488925. ^ a b Nye, Joseph. 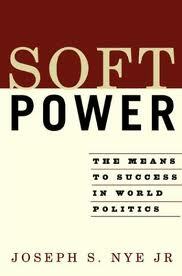 Soft Power: The Means to Success in World Politics (New York: Public Affairs, 2004). ^ a b c Nye, Joseph. Soft Power: The Means to Success in World Politics (New York: Public Affairs, 2004) p. x. ^ a b c Angelo M. Codevilla, "Political Warfare: A Set of Means for Achieving Political Ends," in Waller, ed., Strategic Influence: Public Diplomacy, Counterpropaganda and Political Warfare (IWP Press, 2008). ^ a b c Lord, Carnes, "Public Diplomacy and Soft Power,"in Waller, ed., Strategic Influence: Public Diplomacy, Counterpropaganda and Political Warfare (IWP Press, 2008.) pp. 59–71. ^ a b Nye, Joseph S. (2011). The Future of Power. New York: PublicAffairs. p. 81. ISBN 9781586488925. ^ Nye, Joseph S. (2011). The Future of Power. New York: PublicAffairs. p. 82. ISBN 9781586488925. ^ Janice Bially Mattern, "Why 'Soft Power' Isn't So Soft: Representational Force and the Sociolinguistic Construction of Attraction in World Politics," Millennium: Journal of International Studies 33, no. 3 (2005): 586. ^ Parc, J. and Moon, H.C., 2019, “Accumulated and Accumulable Cultures: The Case of Public and Private Initiatives toward K-Pop”, Kritika Kultura 32: 429-452. ^ McClory, Jonathan (2010-12-07). "The new persuaders: an international ranking of soft power". Institute for Government website. Institute for Government. p. 13. Archived from the original on 2011-07-24. Retrieved 2011-05-06. ^ a b "Soft Power Survey 2018/19". Monocle. 2018. Retrieved 2018-12-21. ^ "The Soft Power 30 - A Global Ranking of Soft Power" (PDF). Portland. July 2015. Retrieved 17 July 2015. ^ "Softly does it". The Economist. 18 July 2015. Retrieved 17 July 2015. ^ "In 'soft power' terms, Japan ranks eighth out of 30 countries in U.K. consultancy report". Japan Times. 15 July 2015. Retrieved 17 July 2015. ^ "Economic warfare on the silver screen". FRANCE 24. 28 June 2011. Archived from the original on 19 January 2012. Retrieved 2012-01-28. ^ Blondheim, Menahem; Segev, Elad (2015). "Just Spell US Right: America's News Prominence and Soft Power". Journalism Studies. 18 (9): 1128–1147. doi:10.1080/1461670X.2015.1114899. ^ Segev, Elad (2016). International News Online: Global Views with Local Perspectives. New York: Peter Lang. pp. 139–153. ISBN 9781433129841. Archived from the original on 2016-06-11. ^ "The Soft Power 30 - Ranking" (PDF). Portland. ^ "The Soft Power 30 - Ranking". Portland. Archived from the original on 16 July 2015. Retrieved 17 July 2015. ^ "Soft power raises exports". VoxEU.org. Retrieved 2015-10-11. ^ a b Nye, Joseph. Soft Power: The Means to Success in World Politics (New York: Public Affairs, 2004). Ch 3. ^ Babiracki, Patryk (2015). Soviet soft power in Poland : culture and the making of Stalin's new empire, 1943-1957. Chapel Hill: The University of North Carolina Press. ISBN 9781469623085. OCLC 911173017. ^ Kirk, John M.; Erisman, H. Michael (2009). Cuban medical internationalism : origins, evolution, and goals (1st ed.). New York: Palgrave Macmillan. ISBN 978-1403983725. OCLC 248348330. ^ "China's soft power offensive". POLITICO. 2017-12-26. Retrieved 2018-06-16. ^ Öztürk, Ahmet Erdi; Sözeri, Semiha (March 2018). "Diyanet as a Turkish Foreign Policy Tool: Evidence from the Netherlands and Bulgaria". Politics and Religion. 11 (3): 624–648. doi:10.1017/S175504831700075X. ISSN 1755-0483. ^ Joseph Nye (3 May 2004). "Europe's Soft Power". The Globalist. Retrieved 30 July 2015. ^ "The Nobel Peace Prize 2012 - European Union (EU)". Nobel Prize. Retrieved 24 December 2013. ^ "From war to peace: European Union accepts Nobel Prize". CNN. 10 December 2012. Retrieved 24 December 2013. ^ a b c d e f g h "Global Diplomacy Index – Country Rank". Lowy Institute. Retrieved 2018-04-01. ^ a b "Soft Power Survey 2012". Monocle. Retrieved 16 December 2013. ^ "Study in the USA". International Student. Retrieved 5 December 2015. ^ Fluck, Prof. Dr. Winfried (2009). "The Americanization of Modern Culture: A Cultural History of the Popular Media*" (PDF). John F. Kennedy Institute for North American Studies, Berlin. Retrieved 5 December 2015. ^ Friedberg, Aaron L. A Contest for Supremacy: China, America and the Struggle for Mastery in Asia, New York: Norton Publishing, 2011. ^ Lord, Carnes, "Public Diplomacy and Soft Power,"in Waller, ed., Strategic Influence: Public Diplomacy, Counterpropaganda and Political Warfare (IWP Press, 2008) p. 60. ^ Steele, Robert D. The New Craft of Intelligence: Personal, Public, & Political: Citizen's Action Handbook for Fighting Terrorism, Genocide, Disease, Toxic Bombs and Corruption. Oakton, Virginia: OSS International Press, 2002. ^ "With New Bank, China Shows U.S. It's Got Soft Power". Forbes. 23 March 2015. Retrieved 31 July 2015. ^ "Global Opposition to U.S. Surveillance and Drones, but Limited Harm to America's Image". Pew Research Center. Retrieved 14 April 2015. ^ Hsu, Jennifer Y.J. ; Hasmath, Reza. "The Overseas NGO Law and its Effects on Chinese NGOs' Contribution to Global". The Asia Dialogue. ^ "Americans in France". U.S. Embassy Paris. Archived from the original on 2015-04-18. ^ "Who are we?". Alliance Française. Archived from the original on 2015-11-20. ^ "The Soft Power 30" (PDF). Monocle. Archived from the original (PDF) on 2015-11-20. ^ "UNWTO Tourism Highlights 2015 Edition" (Press release). UNWTO. 25 June 2015. Retrieved 3 July 2015. ^ "Gerhard Schröder: 'Germany Can Only Lead Europe the Way Porcupines Mate'". Spiegel Online International. 1 April 2013. Retrieved 30 July 2015. ^ "Obama sets off on farewell trip to Europe in shadow of president-elect". Reuters. 14 November 2016. Retrieved 14 November 2016. As the Americans see it, Merkel – and certainly not the vainglorious European commission president, Jean-Claude Juncker – runs the EU. It is Merkel who negotiated the Minsk deal with Russia that defused the Ukraine crisis. She knows Vladimir Putin better than any other western leader does. It is Merkel who took the lead on Syrian refugees and the eurozone crisis. ^ Kimbell, David R. B. Italian Opera. Cambridge University Press, 1994. p. 1. Web. 22 Jul. 2012. ^ "Commedia dell'arte". Treccani, il portale del sapere (in Italian). Retrieved 24 Jul 2012. ^ Zirpolo, Lilian H. The A to Z of Renaissance Art. Scarecrow Press, 2009. pp. 154-156. Web. 16 Jul. 2012. ^ "UNESCO World Heritage Centre". Retrieved 25 Sep 2011. ^ "Beni Italiani Unesco". Associazione Città e Siti Unesco (in Italian). Archived from the original on 2012-07-16. Retrieved 17 Jul 2012. ^ Abbot, Charles (2006). Italy. Morellini Editore. p. 101. ISBN 9788889550137. Retrieved 24 Sep 2011. ^ DK Eyewitness Travel Guide: Italy. Dorling Kindersley Ltd. 2012. pp. 23–24. ISBN 9781405393133. Retrieved 1 Dec 2013. ^ Italy has been described as a cultural superpower by Arab news, by Global Times, by the Washington Post, by The Australian. Italy has been described as a cultural superpower by the Italian consul general in San Francisco, by former Foreign Affairs Minister Giulio Terzi and by U.S. President Barack Obama. ^ Christine R. Yano (2009). "Wink on Pink: Interpreting Japanese Cute as It Grabs the Global Headlines". The Journal of Asian Studies. 68 (3): 681–688. doi:10.1017/S0021911809990015. ^ McGray, Douglas (1 May 2002). "Japan's Gross National Cool". Foreign Policy. Retrieved 11 September 2012. McGray, Douglas (1 May 2002). "Japan's Gross National Cool". Foreign Policy. Retrieved 18 March 2011. ^ Alexey Dolinskiy. How Moscow Understands Soft Power. June 21, 2013. ^ Concept of the Foreign Policy of the Russian Federation Approved by President of the Russian Federation V. Putin on 12 February 2013. ^ "How Russian President Vladimir Putin Became The Most Powerful Individual On Earth". Business Insider. 17 December 2013. Retrieved 1 July 2014. ^ Sergi, Bruno S. (2018-01-01). "Putin's and Russian-led Eurasian Economic Union: A hybrid half-economics and half-political "Janus Bifrons"". Journal of Eurasian Studies. 9 (1): 52–60. doi:10.1016/j.euras.2017.12.005. ISSN 1879-3665. ^ Oliver, Alex (2018-03-30). "How big is the Kremlin's diplomatic network?". BBC News. Retrieved 2018-04-01. ^ "Addressing National Assembly of Republic of Korea, Secretary-General Expresses". United Nations. Retrieved 16 May 2013. ^ Constant, Linda (14 November 2011). "K-pop: Soft Power for the Global Cool". The Huffington Post. Retrieved 17 February 2013. ^ "Korea to turn hallyu into industry". The Korea Herald. Retrieved 17 February 2013. To prevent anti-Korean sentiment, the government will offer incentives for production companies or broadcasters planning to jointly produce movies or dramas with Chinese companies. ^ "Full text of Park's inauguration speech". Yonhap. Retrieved 24 March 2013. ^ JAMES RUSSELL, MARK. "The Gangnam Phenom". Foreign Policy. Retrieved 11 October 2012. First taking off in China and Southeast Asia in the late 1990s, but really spiking after 2002, Korean TV dramas and pop music have since moved to the Middle East and Eastern Europe, and now even parts of South America. ; "Korean pop culture spreads in Cairo". Egypt Independent. Retrieved 14 April 2013 ; Kember, Findlay. "Remote Indian state hooked on Korean pop culture". Agence France-Presse. Retrieved 24 February 2013 ; "South Korea's K-pop spreads to Latin America". Agence France-Presse. Retrieved 28 March 2013 ; Brown, August (29 April 2012). "K-pop enters American pop consciousness". The Los Angeles Times. Retrieved 24 March 2013. The fan scene in America has been largely centered on major immigrant hubs like Los Angeles and New York, where Girls' Generation sold out Madison Square Garden with a crop of rising K-pop acts including BoA and Super Junior ; Seabrook, John. "Cultural technology and the making of K-pop". The New Yorker. Retrieved 4 March 2013. The crowd was older than I’d expected, and the ambience felt more like a video-game convention than like a pop concert. About three out of four people were Asian-American, but there were also Caucasians of all ages, and a number of black women ; Chen, Peter (9 February 2013). "'Gangnam Style': How One Teen Immigrant Fell For K-Pop Music". The Huffington Post. Retrieved 4 March 2013. It is common for Chinese teens in the U.S. to be fans of K-pop, too ; "Black is the New K-Pop: Interview With 'Black K-Pop Fans'". The One Shots. Archived from the original on 3 March 2013. Retrieved 4 March 2013. ^ Sondhaus, Lawrence (2009). Soft power, hard power, and the Pax Americana. Taylor & Francis. pp. 204–8. ISBN 978-0415545334. ^ "SPIEGEL Interview with Wolfgang Schäuble 'Britain Is a Leading Nation'". SPIEGEL Online. 10 June 2016. Retrieved 13 November 2016 ; "Soft Power Committee releases 'Persuasion and Power' report". UK Parliament. Retrieved 11 September 2014 ; "House of Lords: Soft Power debate". UK Parliament. 3 May 2011. Retrieved 11 September 2014 ; "London: the [European] capital of foreign correspondents". European Federation of Journalists. 23 February 2015. Retrieved 29 November 2015. ^ McClory, Jonathan (14 August 2015). "The Soft Power 30 World Rankings" (PDF). Comres. Archived from the original (PDF) on 20 November 2015. Retrieved 2 November 2015 ; "Softly Does It". The Economist. 18 July 2015. Retrieved 2 November 2015 ; "UK is global leader in soft power, world's most comprehensive analysis finds" (PDF). Facebook, Comres, Portland Group. 14 July 2015. Archived from the original (PDF) on 10 November 2015. Retrieved 2 November 2015. ^ "Britain is now most powerful nation on earth". The Independent. 18 November 2012. Retrieved 13 November 2016 ; "U.K. tops list as country with most positive influence". The Globe and Mail. 19 November 2012. Retrieved 13 November 2016. ^ "The best diplomatic service in the world: strengthening the Foreign and Commonwealth Office as an Institution". Foreign and Commonwealth Office. 8 September 2011. Retrieved 16 December 2013 ; "National Security Strategy and Strategic Defence and Security Review 2015" (PDF). HM Government. November 2015. Retrieved 23 November 2015. ^ "Embassies". Commonwealth of Nations. Retrieved 16 December 2013. ^ Report of an Independent Panel chaired by Lord Hannay of Chiswick (January 2015). "The British Influence Scorecard 2015: What influence does Britain have in the EU?". Retrieved 1 August 2015 ; "Review of the Balance of Competences between the United Kingdom and the European Union: Foreign Policy" (PDF). HM Government. July 2013. Retrieved 21 November 2015. ^ "How the Westminster Parliamentary System was exported around the World". University of Cambridge. 2 December 2013 ; Julian Go (2007). "A Globalizing Constitutionalism?, Views from the Postcolony, 1945-2000". In Arjomand, Saïd Amir (ed.). Constitutionalism and political reconstruction. Brill. pp. 92–94. ISBN 978-9004151741. ^ "Britain's Living Legacy to the Games: Sports". The New York Times. 26 July 2012. Retrieved 14 November 2016 ; "Influence and Attraction: Culture and the race for soft power in the 21st century" (PDF). British Council. Retrieved 16 December 2013 ; "Influence and soft power". British Council. Retrieved 14 November 2016. ^ "London 2012: World's Press Heaps Praise On The Olympic Opening Ceremony". The Huffington Post. Retrieved 22 December 2013 ; "Review of Impact of London 2012 Games on Perceptions of Britain Overseas" (PDF). Visit Britain. Retrieved 16 December 2013. ^ "London's three Olympic Games compared". BBC. 24 July 2012. Retrieved 16 December 2013. ^ "About British Council Film". British Council Film. Retrieved 22 December 2013 ; "London Tops MasterCard Global Destination Cities Index as Most Visited City". Mastercard. 9 July 2014. Retrieved 7 October 2014. ^ "Study In the UK". International Student. Retrieved 16 December 2013 ; "International Student Statistics". UK Council for International Student Affairs. Retrieved 16 December 2013 ; "Why the rarefied world of UK boarding schools appeals to parents around the world". Financial Times. 2015. Retrieved 13 November 2016 ; "QS World University Rankings 2016-2017". QS Top Universities. Retrieved 13 November 2016 ; "Inside the secret and lucrative world of 'the super tutor'". BBC. 5 July 2017. Retrieved 5 July 2017. ^ "English Common Law is the most widespread legal system in the world" (PDF). Sweet & Maxwell. November 2008. Retrieved 16 December 2013 ; "UK leading the way as an international centre for legal services and dispute resolution". The City UK. 30 January 2014. Retrieved 5 June 2015. ^ Roberts, Richard (2008). The City: A Guide to London's Global Financial Centre. Economist. p. 2. ASIN 1861978588 ; "International Financial Centres Initiative". TheCityUK. Retrieved 16 December 2013. ^ "London is the soft power and high skills capital of the world". Deloitte. 2 March 2016. Retrieved 2 March 2016 ; "Cities of Opportunity 7" (PDF). PwC. 7 September 2016. Retrieved 7 September 2016 ; "Global Power City Index 2016". Institute for Urban Strategies, The Mori Memorial Foundation. 18 October 2016. Retrieved 20 February 2017 ; "European attractiveness survey 2016 - European cities". EY. 24 May 2016. Retrieved 20 February 2017. ^ Joshi, Shashank (27 March 2018). "How Vladimir Putin's arrogance handed Theresa May a diplomatic coup". CNN. Retrieved 27 March 2018. ^ Borger, Julian (27 March 2018). "Western allies expel scores of Russian diplomats over Skripal attack". The Guardian. Retrieved 27 March 2018. ^ "US, Europeans and allies kick out more than 100 Russian diplomats". POLITICO. 2018-03-26. Retrieved 2018-03-28. ^ "Russia blames Washington pressure for western expulsions of Russian diplomats". euronews. 2018-03-27. Retrieved 2018-03-28. ^ "Nato slashes Russia staff after poisoning". BBC News. 2018-03-27. Retrieved 2018-03-28. ^ James, William (27 March 2018). "May calls for 'long-term response' to Russia after spy poisoning". Reuters. Retrieved 28 March 2018. ^ "57th Meeting Of The OPCW" (PDF). OPCW. 4 April 2018. Retrieved 5 April 2018. Giulio Gallarotti, The Power Curse: Influence and Illusion in World Politics, Boulder, CO.: Lynne Rienner Press, 2010, an analysis of how the over reliance on hard power can diminish the influence of nations. Giulio Gallarotti. "Soft Power: What it is, Why It's Important, and the Conditions Under Which it Can Be Effectively Used" Journal of Political Power (2011), works.bepress.com. Soft Power and US Foreign Policy: Theoretical, Historical and Contemporary Perspectives, ed. Inderjeet Parmar and Michael Cox, Routledge, 2010. Steven Lukes, "Power and the battle for hearts and minds: on the bluntness of soft power," in Felix Berenskoetter and M.J. Williams, eds. Power in World Politics, Routledge, 2007. Janice Bially Mattern, "Why Soft Power Isn't So Soft," in Berenskoetter and Williams. J.S. Nye, "Notes for a soft power research agenda," in Berenskoetter and Williams. Young Nam Cho and Jong Ho Jeong, "China's Soft Power," Asia Survey 48, 3, pp. 453–72. Yashushi Watanabe and David McConnell, eds, Soft Power Superpowers: Cultural and National Assets of Japan and the United States, London, M E Sharpe, 2008. Ingrid d'Hooghe, "Into High Gear: China's Public Diplomacy", The Hague Journal of Diplomacy, No. 3 (2008), pp. 37–61. Ingrid d'Hooghe, "The Rise of China's Public Diplomacy", Clingendael Diplomacy Paper No. 12, The Hague, Clingendael Institute, July 2007, ISBN 978-90-5031-117-5, 36 pp. "Playing soft or hard cop," The Economist, January 19, 2006. Y. Fan, (2008) "Soft power: the power of attraction or confusion", Place Branding and Public Diplomacy, 4:2, available at bura.brunel.ac.uk. Bruce Jentleson, "Principles: The Coming of a Democratic Century?" from American Foreign Policy: The Dynamics of Choice in the 21st Century. Jan Melissen, "Wielding Soft Power," Clingendael Diplomacy Papers, No 2, Clingendael, Netherlands, 2005. Chicago Council on Global Affairs, "Soft Power in East Asia" June 2008. Joseph Nye, The Powers to Lead, NY Oxford University Press, 2008. Nye, Joseph, Soft Power: The Means to Success in World Politics. Matthew Fraser, Weapons of Mass Distraction: Soft Power and American Empire (St. Martin's Press, 2005). Analysis is focused on the pop culture aspect of soft power, such as movies, television, pop music, Disneyland, and American fast-food brands including Coca-Cola and McDonald's. Salvador Santino Regilme, The Chimera of Europe's Normative Power in East Asia: A Constructivist Analysis Regilme, Salvador Santino Jr. (March 2011). "The Chimera of Europe's Normative Power in East Asia: A Constructivist Analysis" (PDF). Central European Journal of International and Security Studies. 5 (1): 69–90. Archived from the original (PDF) on 2012-03-12. Paul Michael Brannagan and Richard Giulianotti (2018), The Soft Power-Soft Disempowerment Nexus: the case of Qatar, International Affairs, 94(5), pp. 1139-1157, for an analysis on the ways through which states' attempts at soft power can backfire, leading to instances of 'soft disempowerment'. Look up soft power in Wiktionary, the free dictionary.